You’re currently viewing our secondary school information. Want to switch to primary? Looking to try our secondary classroom resources? Classroom resources and planning support are just one element of the Mathematics Mastery programme - and are fully integrated with the training and specialist support we offer. Here are some examples. Schools who join our programme receive a variety of adaptable materials – alongside training and support – to make this happen. Our materials equip you to design and deliver your own lessons more effectively. They are not intended to restrict or spoon-feed you, but we do offer additional support for non-specialists or less experienced teachers. 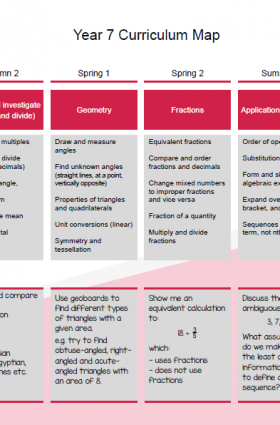 Packed with problem solving ideas, our resources align with the new GCSE and support you to build a solid foundation of conceptual understanding through Key Stage 3. You can download our sample materials and for a more detailed look at what we offer, sign up to receive a free trial of our classroom resources using the form below. The sequence of topics covered through year groups, to encourage deeper understanding. 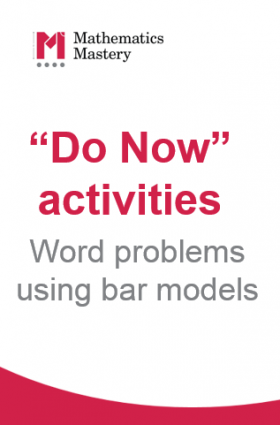 Short, fun starter activities encouraging students to solve problems using bar models. 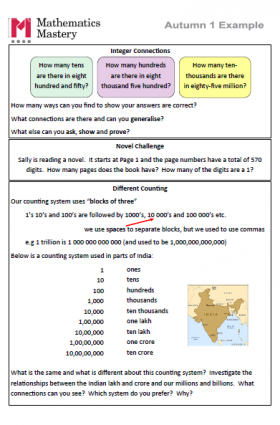 Place value activities with added depth and challenge to strengthen students' understanding. Want to explore our classroom resources in more depth? Sign up for a free trial of the Mathematics Mastery programme. You’ll receive a series of emails over several weeks – packed with videos and materials looking at how to teach different topics across a range of year groups. You’ll see how our classroom principles are brought to life and you'll get a taster of the professional development we offer teachers. We respect your time and your privacy &dash; we promise we’ll never pass your details on or send you irrelevant emails. We offer two separate programmes, one for primary schools and one for secondary schools. Please make a selection below in order to continue. You can change your mind at any time by switching your selection on the top bar.